Democrat leads in Mississippi Governor race polling…. Mississippi is a SOLID Red state…. Democrat Jim Hood still holds a slim lead over Republican Tate Reeves in what currently appears to be the most likely gubernatorial general election match-up. Statewide, 44% of voters currently support Hood, while 42% back Reeves and 14% are undecided. However, the race has steadily tightened over the past year. Hood held a six- point advantage in December 2017 and a five-point lead last April. Additionally,Hood’s edge could simply be the product of his current 11% statewide namerecognition advantage (91%-80%). There is speculation that retired state Supreme Court Justice Bill Waller, Jr. is considering a run for governor, possibly as an independent candidate. WhileWaller is a Republican, his father was elected to the governor’s office as aDemocrat. He could generate cross-party appeal, but if he does not win the question becomes how much support will he generate from each side? It could prove to be the deciding factor that swings the outcome in a close race. Currently, a Waller candidacy does not tip the balance in favor of one candidate or the other. In a three-way race, Hood maintains his two-point lead over Reeves (40%-38%), Waller draws 9% of the vote and 13% are undecided….. 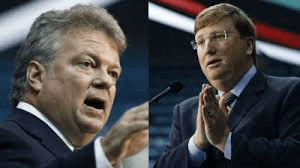 The election for Mississippi Governor is November 5, 2019….